We’re welcoming Melissa from The Paisley Owl to Minds in Bloom today. 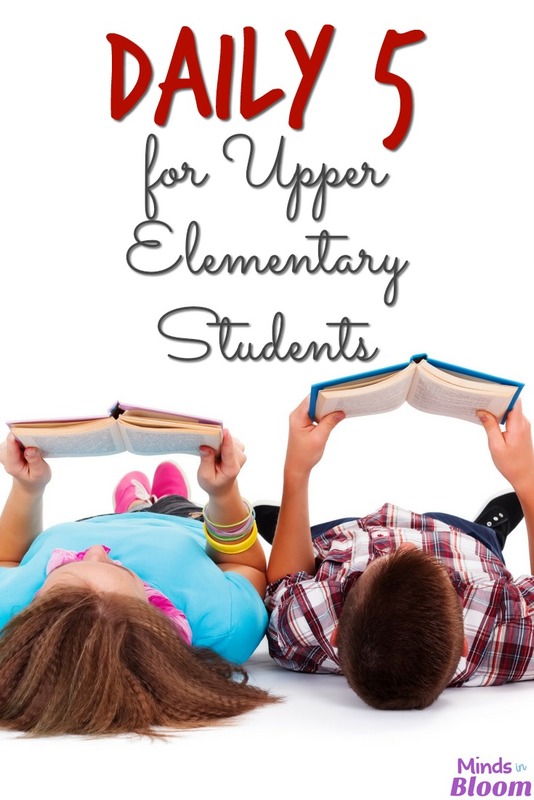 She’s got some excellent tips for those of you who teach upper elementary but still want to implement the Daily 5™ in your classroom. How can I put students at the center of their own learning? How can I hold students accountable during language arts centers? How can I differentiate to meet the needs of all of my students? How can I do guided reading but ensure that my other students are on task? If you have asked yourself some of these questions, then the Daily 5™ model may just be something you should incorporate into your classroom! When I first read about the Daily 5™, I knew I just had to do it, but I wasn’t quite sure how to adapt the model to fit the needs of an upper elementary classroom. I knew that I wanted to incorporate read to self, word work, and work on writing. I decided not to use read to someone or listen to reading as Daily 5™ centers, since they did not fit what my class needed. 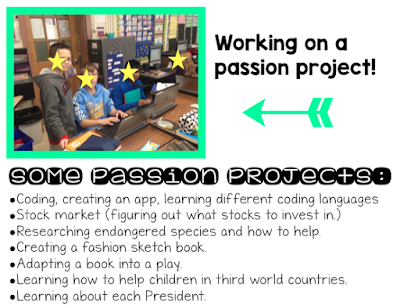 Instead, I created two different centers: passion project (genius hour) and Edmodo. 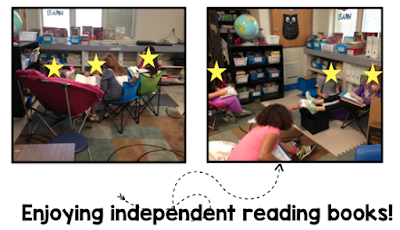 This is an independent reading center where students use what they learned in guided reading and apply it! I followed what the two sisters suggested at this center. My fifth graders were able to pick any book of their choice and choose anywhere comfortable to sit and read! Just an FYI, I did not have books leveled in my independent reading library. I am a big believer in students choosing a book based on what they are interested in! After all, kids are not going to browse Barnes and Noble or their Kindle based on their reading level! Instead, mine were sorted by genre and category. When I first thought about the Daily 5™, I was concerned about holding my students accountable at this center. To do this, I created “readers restaurant” menus where students choose a pre-reading, a during reading, and an after reading activity! For example, students might write about the genre of the book and why they chose it, make text connections while reading, and a poster advertising their books at the end! In addition to this, I also “checked in” with each student when I met with them for guided reading! I loved hearing about the wonderful good-fit book choices they made! My school district uses a Writers Workshop model, so this center was in addition to teaching the regular writing curriculum. I wanted my kids to ENJOY writing, instead of telling them, “This is what you have to write about,” and Work on Writing was just perfect for that! It is amazing how many magical, amazing, wonderful stories were written at this center. I provided students with their writing journals, which were stored at this center for them. I also had laptops available for them to type. I left menus hanging up on the wall for students to choose from if they needed some inspiration. For example, one menu included reading response activities where they could write about their independent reading books. Choices included planning a birthday party for a main character, rewriting the ending, and writing a sequel! This center served as my vocabulary center. It was a class favorite! Word Work looks SO DIFFERENT in an upper elementary classroom. I adored all of the cute word work I found on Pinterest and on TPT, but I really had a tough time finding word work that was appropriate for fifth graders. I decided to make the word work myself! For example, one activity included “my pet word” where students had to imagine what would happen if their word was a real life pet! To store word work, I grabbed some trifold boards from the Dollar Tree, attached some laminated file folders, and stored all of the worksheets in the folders. Students just grabbed their choices, got to work, and put them in their Daily 5™ folders at the end of the rotation! 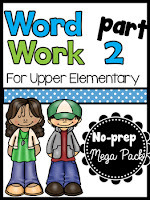 If you’d like to grab a copy of my Word Work activities, you can click the link below! If you love using technology in your classroom, then Edmodo is something you should take a look at! It’s FREE! I was lucky enough to have a computer cart in my classroom, so I had my students login to their Edmodo accounts at this center. I created guided reading group pages on Edmodo and posted questions for students to answer. It was also a great place for them to have discussions with each other about the books and share their thoughts! 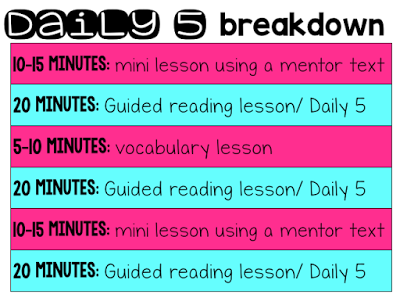 I was inspired by so many amazing blog posts about passion projects and Genius Hour that I knew I just had to find a way to incorporate it into my Daily 5™ rotations. For this center, students thought about a topic they wanted to research and present to the class. Before beginning their projects, students were required to submit “project proposals” to me. After I approved them, they began researching, taking notes, and putting together their projects! It is so amazing what they came up with! I had students teach themselves how to code using Code Academy, learn how to help endangered sea turtles, and start a fashion sketch book! When they finished their projects, they presented them to the class. How do I fit so much into one day!? Okay, real talk. It is OKAY for kids to only get to each center one, two, maybe three times a week. We did what we could with the time we had! I was usually able to fit at least three rotations in a day but sometimes less! What about the rotation board? I’ve seen lots of teachers put their rotation board up on their SMARTBoard. I didn’t have that option, so I used a pocket chart! The kids looked at the board to find their first center, then rotated in order from there. At the end of the Daily 5™, I had a helper move everyone to where they were supposed to start the next day. Easy-peasy! What is the teacher doing during this time? Meeting with small groups! I followed the launch play from the Daily 5™ book to a “T”. I made it very clear that students were not to approach me while I was working with a guided reading group unless it was an emergency. How do you get kids to work independently? It takes about ONE MONTH (yes!) to build students’ stamina for each Daily 5™ rotation. You can read all about it in the Daily 5™ book! It is important to start slow and and PRACTICE! For example, we started off Read to Self with the kids reading for about six minutes! I added 1-2 minutes each time to increase their stamina until we reached 25 minutes. We did this with each Daily 5™ center. It was SO worth it. I am Melissa (The Paisley Owl). I taught upper elementary for a few years, and I am currently making the journey down to Kindergarten! I am a graduate of the Rutgers Graduate School of Education. I am passionate about finding new ways to differentiate instruction, and I believe that if the bar is raised high, students will excel. For upper elementary center work to go along with the Daily 5™, you can head on over to my Teachers Pay Teachers store or visit my blog. Do you have a Readers Restaurant sheet? I was looking in your store and I didn’t see anything. I love this idea. Great ideas. Other options for older students might be Work with Literary Elements or Talking about Literature/Book Circles. I have also altered Working with Words, so that it’s now Working with Writing Conventions and it includes punctuation, grammar and sentence structure. It’s such a good structure that it can be incorporated into any grade level to continue developing independence and skills.